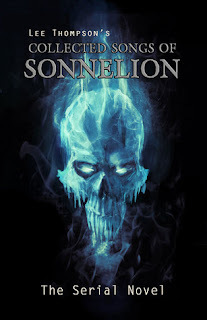 The last chapter of Lee Thompson's serial novel Collected Songs of Sonnelion was posted to the Darkfuse website today. This means for the next few weeks the entire novel will be available to read for free! Collected Songs of Sonnelion is part of Thompson's Division Mythos. Don't fret if you haven't read any stories from his mythos yet. They have all pretty much been written and published out of chronological order. Just jump in! In this Division Mythos novel, which is being serialized on Darkfuse's website, Red Piccirilli has known madness and magic. They’re in his blood and bound to his soul as much as love and loss are. But when his family moves to the town of Division, Pennsylvania, his father grows distant, his mother troubled, and a murderer roams the countryside. He searches for meaning and truth while battling his own darkness and rage and despair, but corpses whisper answers the dead only share with one another. If you have trouble viewing Collected Songs of Sonnelion on the Darkfuse site, you can also access it on Issuu. While I'm on the subject of Lee Thompson and his Division Mythos, Beneath the Weeping Willow has been published as a stand alone short story. (It originally appeared in Shock Totem 4.) It is an awesome glimpse into the Division Mythos and Thompson's uniquely dark and imaginative writing style. It is written in second person and well worth the read. Lots of good stuff to check out folks.